Fee: $32/$27 members - includes an autographed copy of The Lost Family, refreshments, and admission to the sculpture garden. Come early to stroll the grounds. Register by phone at 414-446-8794. Margy Stratton, founder and executive producer of Milwaukee Reads produces this series of events featuring writers of particular interest to women. Lynden Sculpture Garden's Women's Speaker Series and Boswell Books welcome Jenna Blum, author of The Lost Family, back to the Lynden Sculpture Garden, Thursday, August 9, 7 pm. For more information on upcoming Women's Speaker Series Events, click here. In 1965 Manhattan, patrons flock to Masha’s to savor its Brisket Bourguignon and admire its dashing owner and head chef Peter Rashkin. With his movie-star good looks and tragic past, Peter, a survivor of Auschwitz, is the most eligible bachelor in town. But Peter does not care for the many women who parade through the restaurant hoping to catch his eye. Running Masha’s consumes him, as does his terrible guilt over surviving the horrors of the Nazi death camp while his wife, Masha—the restaurant’s namesake—and two young daughters perished. Then exquisitely beautiful June Bouquet, an up-and-coming young model, appears at the restaurant, piercing Peter’s guard. Though she is twenty years his junior, the two begin a passionate courtship. When June unexpectedly becomes pregnant, Peter proposes, hoping a new family will allow him to let go of the horror of the past. But over the next two decades, the indelible sadness of those memories will overshadow Peter, June, and their daughter Elsbeth, transforming them in shocking, heartbreaking, and unexpected ways. 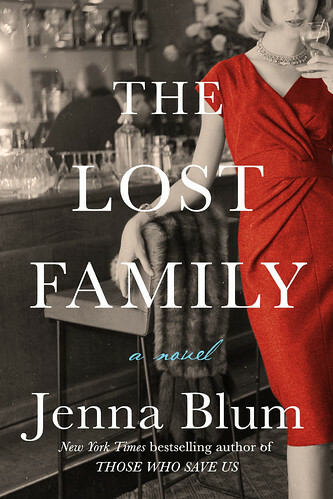 Spanning three cinematic decades, from the explosive 1960s and swinging 1970s to the glittering 1980s, Jenna Blum artfully brings to the page a husband devastated by a grief he cannot name, a frustrated wife struggling to compete with a ghost she cannot banish, and a daughter sensitive to the pain of both her own family and another lost before she was born. Jenna Blum is the New York Times and # 1 international bestselling author of novels Those Who Save Us and The Stormchasers and the novella “The Lucky One” in Grand Central. Jenna has taught novel workshops for 20 years at Grub Street Writers in Boston, where she earned her M.A. at Boston University. In addition to interviewing Holocaust survivors for the Shoah Foundation, Jenna is a public speaker and avid cook: she creates and tests all the recipes in her novels. Please visit Jenna on her website, http://www.jennablum.com, and on Facebook, Instagram, and Twitter (@Jenna_Blum). The Lynden Sculpture Garden offers a unique experience of art in nature through its collection of more than 50 monumental sculptures sited across 40 acres of park, lake and woodland.